Your workspace influences your productivity. To generate ideas, solve problems, and stay productive at work, you should take care of working environment. Even if you work from home. Especially if you work from home. To make them easy to remember, many bloggers and online experts thought on creating step-by-step manuals to help everyone with home workspace organization. As they say, one picture is worth a thousand of words. That is why infographics like this one, for example, cope with the task better, visually expressing the details that can be hardly described by words. Your writing desk is the #1 thing to pay attention in your workspace. As far as you spend the most time at it, first of all, try to get out of clutter. Yes, we all know about a so-called creative chaos. But anyway, physical clutter is proven to reduce our ability to focus, so try to avoid it and keep your writing desk clean. Live plants to clean the air and reduce stress. A desk lamp with a cold color temperature of 3500K-4000K to stimulate brains. A cup of green tea to improve brains functions and boost productivity. There is no need to force yourself and drink tea because coffee has a positive impact on our mind, too. It's not surprising that many famous writers had a habit of drinking coffee while working, as caffeine is proven to stimulate memory and increase a serotonine level in brains, which helps us stay positive. To stay active and concentrated, take care of three main factors influencing your work: plants (see above), open windows (fresh air is our everything), and daylight, which is proven to impact your health and productivity positively. So, when organizing your home workspace, try to do it in a way to increase the time of working in daylight. For example, you can place your desk by the window. Also, you might want to change the color of your walls to help your productivity a lot. The fact is that a color impacts our work despite we all have different color preferences. What is the walls color at your workplace? Think of changing it if your walls are gray or beige, as they cause depression and sadness, influencing our mood and productivity as a result. According to the study from the University of Texas, blue or green colors would be the best variants as they increase the effectiveness of our work. 1) A computer zone is your workplace, a desk and a chair where you spend the most of your time. 2) A non-computer zone is a corner for relaxation where you can take some rest, gain inspiration, or do some non-computer work like brainstorming, making notes, communicating with clients, generating new ideas, etc. Your non-computer zone is a place for cozy sofas, favorite blankets, work-related books, pets, meditation, and other things that inspire you and motivate you to keep working. We all know about the negative influence of sitting work but still continue spending hours at computers, forgetting about it. Proper workspace ergonomics protects your health, saving from back pain, swollen feet, and cramped fingers. Even minor changes of equipment can make your workspace more comfortable and healthy. Computer: All-in-one PC would be the best variant for working from home, as it combines advantages of PCs and laptops and lets to forget about frustrating wires. Chair: Properly adjusted tools influence productivity, and your chair is not an exception. Ergonomic office chairs encourage good posture and support a lower back, so think on adjusting your chair as well as your desk height and computer screen for better work. Standing desk: Health scientist Nicolaas P. Pronk insists that we should try standing work to be healthy and productive. So, you might want to try sitting/standing desks at your workplace. If you have no opportunity to do that, it would be a good practice to stand up every hour for 10-15 minutes. Elliptical trainers: Combining the benefits of bikes and steppers, they will be perfect for your home workspace. They don't take much place, and you can use them with no distraction from your work. They can design a workplace the way they want! I bet you are creative enough to make your workspace cozy, productive, and (what is more important) inspiring. Remember that even small details like a photo of your sweetheart person or a quote from your favorite writer might motivate you and revive your spirits for better work. Think of something that inspires you and decorate your workplace accordingly. 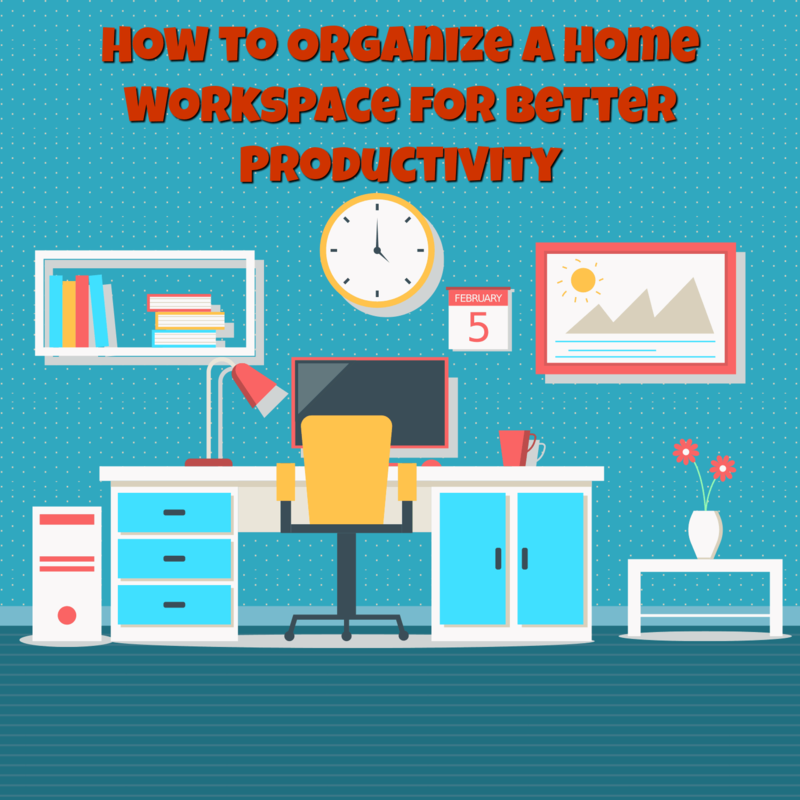 Home workspace organization is a significant aspect to pay attention if you want to stay productive and do your job the best you can. The problem is, many freelancers consider it an unnecessary waste of time and believe they can reach fabulous results, spending hours on a sofa under a blanket and with a laptop in hands. Influencing our mood, desire to work, effectiveness, and productivity, working environment should be structured carefully. Follow the above pieces of advice to organize your workspace for better productivity, and you will see the positive results soon. Do you work from home? Have you ever thought of organizing your home office by the book? What does help you boost productivity and work better? This is a guest post by Lesley Vos, a writer and online tutor, contributing to many publications on personal growth, productivity, work, and education. Follow her on @LesleyVos to read her writings and ask questions.